Welcome to your workspace operations dashboard, where you can check the status of past and current pipelines run, drill down into various views of what’s going on and find direct links to all input and output files involved. Submission: a collection of workflows that you have submitted in one batch. Workflow: in this context, the term workflow refers to a particular run of a method on a specific dataset. Task: the lowest level of analysis reporting representing individual calls/jobs made during workflow execution. By default the Monitor page lists all submissions that have been made so far in a workspace along with their status; it is possible to filter the list, but it is not possible to delete any submissions. Similarly, it is not possible to delete workflows within a submission. For guidance relating to deleting files that belong to past submissions, please see the forum. After you’ve launched a new submission, the Monitor page is loaded for you automatically so you can see the list of one or more workflows that are contained in the submission, along with their current status and links to further information. You can always go up one level to view all submissions by clicking on the Monitor tab – but for now let’s assume we just launched an analysis and we want to drill down into the status of a particular workflow. Following Submitted is “Running;” it means that the commands specified in the method WDL script are being executed on virtual machines. Note: Aborted and Aborting status will display for analysis submissions, workflows, and tasks if you have requested a workflow to be aborted. These are not pictured here. When all the tasks reach Done successfully, the workflow will be updated to Succeeded, and the Monitor page will show the submission as Done. You can look for outputs in the data model (via the Data tab) if you filled out the Outputs section (this.X) of the method configuration. Remember “this” refers to what data entity you are running your method on. If you chose participant and called an output this.participant_file, a new column will display in the participant section called participant_file and a link to the output will be put there, while the actual output file will be saved to the workspace’s bucket. You can also view outputs on the Monitor page by clicking on the method configuration listed in the table, opening up the workflow you want to view, and selecting Outputs. FireCloud takes the workflow specified in the WDL and asks Cromwell to run it. 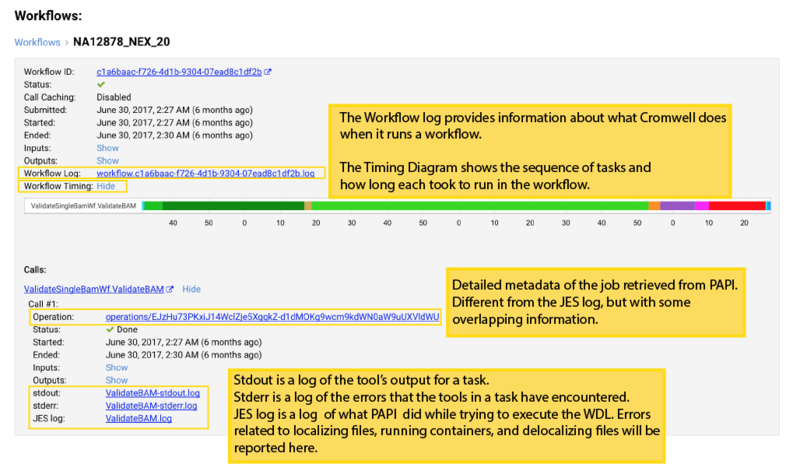 Cromwell asks the Google Pipelines API (PAPI) to launch each task in the workflow when the inputs become available. Cromwell is responsible for managing the sequence of the tasks/jobs. PAPI starts a virtual machine per task and provides the inputs; the WDL specifies what it should do, the environment to do it in (the Docker image), and requests the outputs when it is done. Each virtual machine’s (VM) requirements can be specified in the task (RAM, disk space, memory size, number of CPUs). Once the task is done, PAPI will shut down the VM. The Docker required for each task will be pulled to the virtual machine along with any inputs from Google buckets. When the output is produced, it will be put in the Google bucket of the workspace where the analysis was launched. Links to the outputs will be written back to that workspace’s data model. Sometimes your workflow fails (oh, the humanity!) and you need to troubleshoot. To learn about what is failing in your workspace, you can open the failed task to view more. Other than the Failure message, you can check out the task’s stdout log, stderr log, JES log (JES is now named PAPI), or Operation metadata to piece together what happened. Bugs & Feature Requests: List of known bugs, limitations, and requested enhancements. Forum: Ask the support team a question directly or see if other users have asked your question. The support team tries to respond to every question within one business day. You can access the User Guide or Forum while in FireCloud at any time by clicking the question mark in the top right corner. This concludes the orientation tour. For your next step, check out the Tutorials section.